AHHHH!!! Look at him! He's so BLUE. I think he looks more like Gonzo with that beak of his. Good luck to you guys living with him for the next 30 years! We've had parrots when we were kids. Don't offer your finger, they are vicious! S/he's so pretty! And I LURRRVE the name! Heee hee...hopefully you don't go insane. I'm pretty sure my momma would. 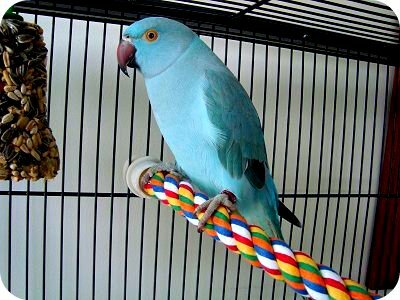 He's a cute bird though--all bright and blue. we have two parakets, its nice to hear their sweet little chirps, they only get crazy when they have to dig a little for seeds in their dish... probably complaining to me! lol spoiled! Grover may drive you crazy if he/she learns how to make the same sound as your phone. My friend had a bird who would "ring", and they would go answer the phone all the time... drove her a little loopy. i have absolutly no doubt he will drive you mad. good luck. We used to live next door to one, his favourite words were swear words. No matter what was said to him! Hahaha. Kristy you are a saint! Honestly, birds are not my thing. I remember visiting my aunty who had a bird like yours... she used to wear arm-length protective gloves to clean out the cage and this bird would just peck away at her! She finally got feed up and put it in a public avery.. one of those walk through ones. We went to have a look one day with our Aunty and this bird seriously dive-bombed her. Hilarious (to watch, obviously for her, quite traumatic). Good luck friend! Saint Kristy...keeper of a gazillion household pets! LOL 25-30 years!!!! Are you kidding me??????? After reading all the comments I am even laughing harder...your hubby should read these!!! maybe not into getting it's picture taken???? Haha guys - cracking up at your comments! I think Grover looks slightly angry cause the flash on my camera was freaking it out. wow, 25-30 that's a healthy lifespan. Just consider the words you teach them carefully because if it isn't annoying the first ten times it says it, it might drive you crazy when that is all it utters. :) good luck! Hey he is a really nice shade of blue after all and looks like an interesting character. I wonder what he will have to say for himself when he starts to talk!!!!! he, no, scratch that, IT really is too cute. i love it's color. is it bad to want one just like that only because i think it would match my house?!? haha Kristy, he is cute - and they do make quite fun pets (I'm assured by the Harris' house and the Squires). Jonny still has his larakeet in Auckland. He's pretty cool. hehe all i can say is play with him ALOT! the more attention and handling you give them the better they are! *while sitting here with mine on my knee*. Also if you can close them off with a door sometimes, it helps when they are being noisey!